On our trip to the Virginia Museum of Fine Arts, Mom and I decided to pick two galleries to visit. We opted for South Asian and 21st Century. South Asian art always has such an appeal for me. I love the architecture and sculpture and textiles. 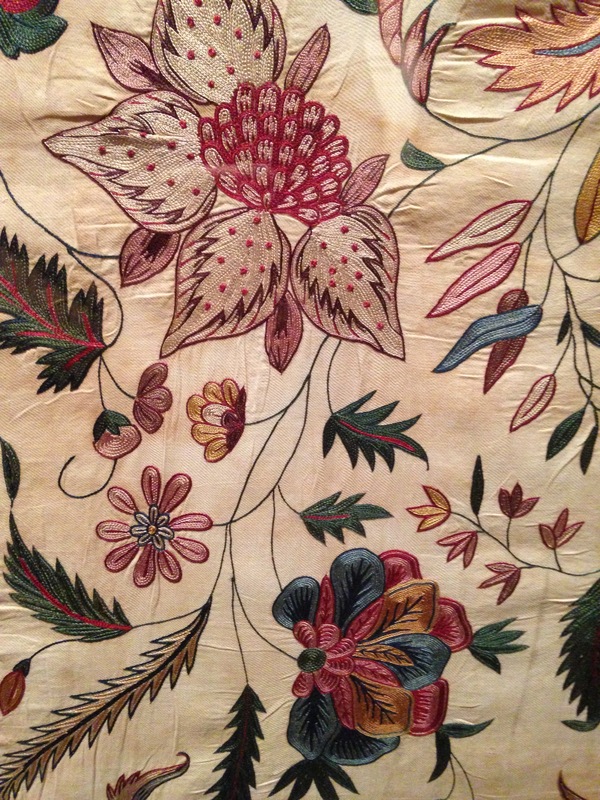 VMFA has some particularly exceptional pieces, including an entire 19th century pavilion and silk Gujarat textiles so finely embroidered you are reduced to abject admiration of each tiny, precise, vibrant stitch. Mom read Arabian Nights in its entirety one summer when she was a kid and has had an affinity for its jeweled-toned illustrations since. So this North Indian / Mughal watercolor and ink illustration appealed to her right away. Not unlike Scheherazade, this vina-playing yogini has completely captivated her audience. Check out all those fine lines and darts of bold color. 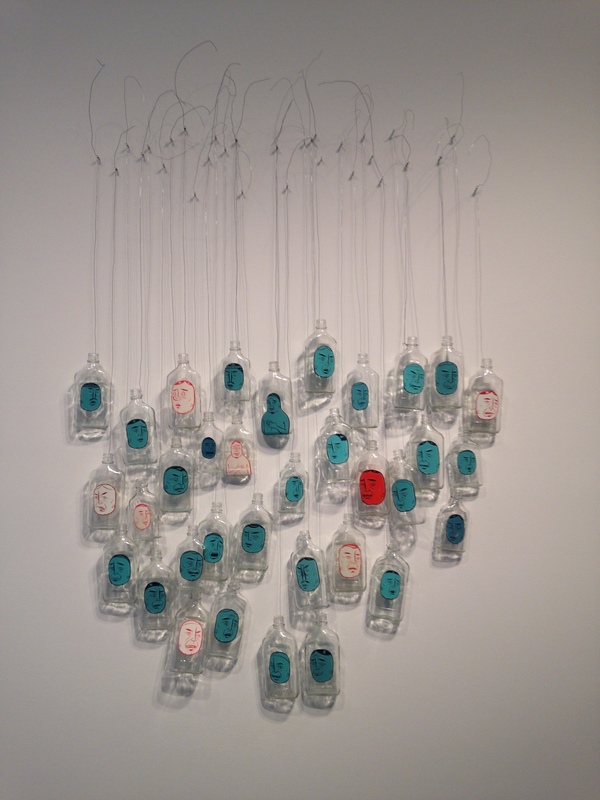 One of the things I found myself thinking about as we walked through the South Asian gallery is how cross-cultural and geographically interconnected artist creation has always been. 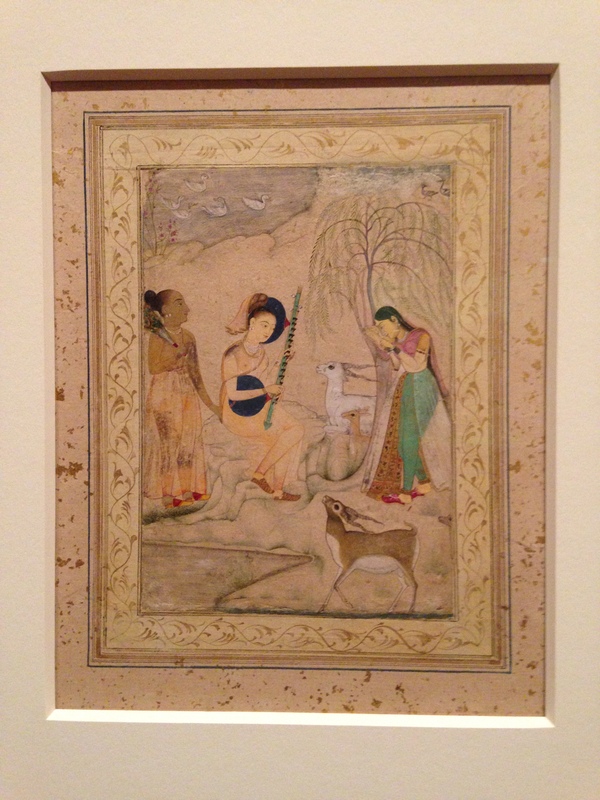 The museum’s curatorial staff believe the illustration is a Mughal copy of a North Indian painting. The embroidered textile was created in the worldwide embroidery center at Gujarat, which traded textiles to the European market. After an obstacle-ridden year, Ganesha has had a lot of resonance for me lately as the remover of obstacles. And in his correlative role as the lord of new ventures and patron of arts and letters, he feels like a good presence to hold onto during this new year of risk-taking and book-writing. Back in November, when I was just beginning to wrap my head around this new adventure, Mom spent a weekend with me in Baltimore, and we went down to check out the Ganesha at the Walters Art Museum down the street from my apartment. This week Mom overcame a few of her own big obstacles, so with both of us starting new ventures, this Dancing Ganesha feels fittingly celebratory. 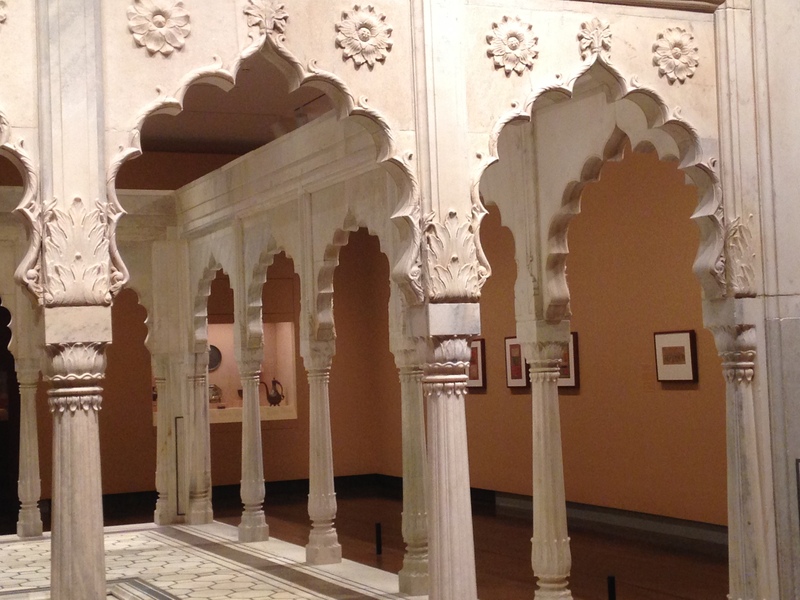 The 21st Century gallery was a great complement to the South Asian collection: equally fabulous and, in its own way, both as spare and as ornamental. Barry McGee bought empty liquor bottles from nearby San Francisco Mission District hobos and painted them with portraits of their owners. This clean-lined piece carries a lot of tangled social commentary and resists being reduced into any one, simple message-based meaning. Yet for all its interest in societal observation, the piece is also deeply human. The portraits are expressive and startling in their empathetic reach. 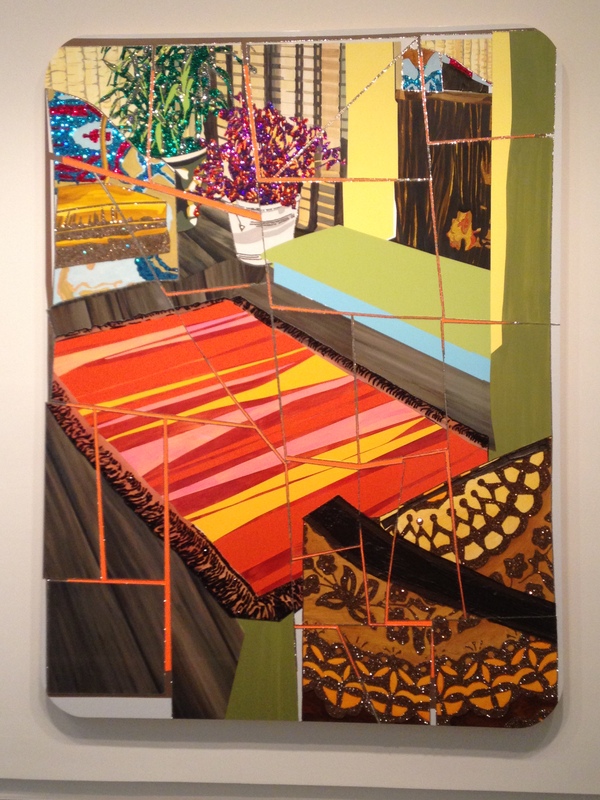 Mom and I both stopped to sit for a while with Mickalene Thomas and her Interior: Two Chairs and Fireplace. The rich pattern and ornamentation of this rhinestoned 1970s-inspired interior has put all kinds of art history into play, including all those early-Nice Matisse interiors I love. 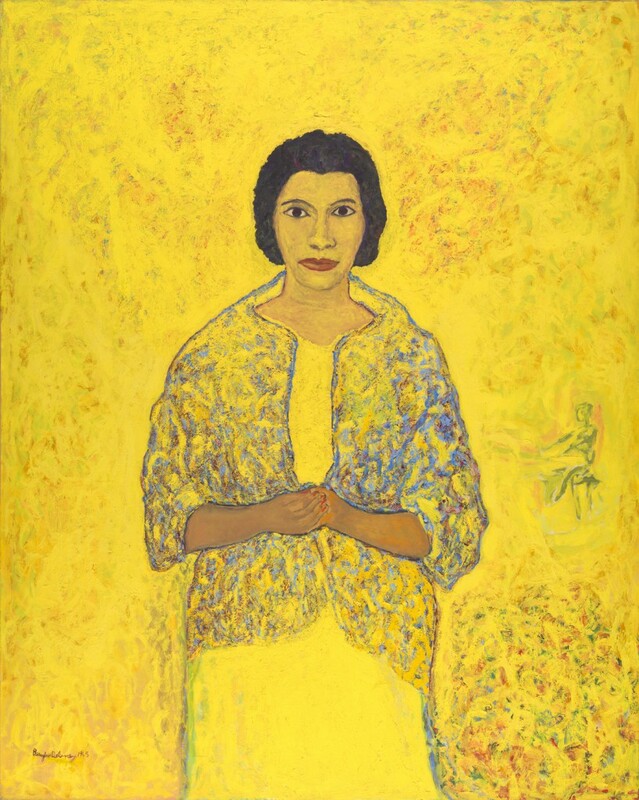 And though we had chosen our two galleries, we couldn’t help but stop briefly in 20th Century to admire Beauford Delaney’s stunning portrait of Marian Anderson*, which is too arresting and luminous and potent not to see in person. This entry was posted in Arts, Travel and tagged Mickalene Thomas, Richmond, Road Trip, Virginia, Virginia Museum of Fine Arts. Bookmark the permalink. Absolutely beautiful photos and post. Inspiring. Thanks, Melissa. I too love South East Asian Art. We will definitely have to do galleries together sometime! Thanks, Tori! I think we would have a blast at an art museum! Beautiful picks! I have always loved Ganesha. Thanks, Erin! He’s really wonderful, isn’t he?